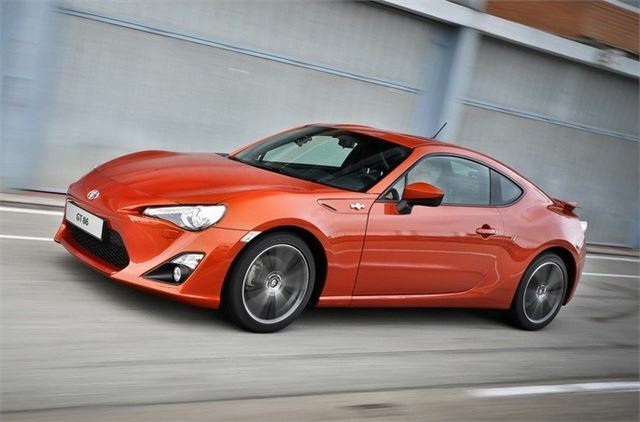 The Toyota GT86 is now available to order at dealers with the first cars due to arrive with their new owners on 1 July. The coupe is the first sports car from Toyota since the MR-2 went off sale in 2007 and promises to add some fun back into the range. Prices start at a very affordable £24,995 for the manual version while the six-speed automatic costs £26,495. It's powered by a 2.0-litre boxer engine and has a rear-wheel drive set-up designed for nimble handling. On the outside it has 17-inch alloys, a rear spoiler, chrome dual exhaust pipes and a limited slip differential as standard. There are also xenon headlights, LED daytime running lights and front fog lights. Seven colours are available - Dark Red, Silver metallic, Black metallic, Blue metallic, Dark Red metallic, Orange metallic and Pearl pearlescent. Optional side, roof and bonnet decals are available in black or silver. Inside, the GT86 has sports seats, aluminium pedals, contrasting red stitching on the steering wheel, a leather gear lever and a leather parking brake. Black cloth upholstery is standard while leather and Alcantara is optional. There is also black leather with red Alcantara and additional red leather details on the door grips, steering wheel, gear lever and parking brake. Both of these options include heated front seats. It looks well equipped too. There's just one trim level and it comes with dual-zone air conditioning, cruise control, an auto-dimming rearview mirrors, hill-start assist, Bluetooth, a USB port and a touchscreen control system for the stereo. This can be upgraded to Toyota Touch and Go, a sat nav system that includes safety camera warnings plus on-board connection to Google Local Search and (via subscription) services providing such as fuel price information and local weather forecasts. Safety kit includes a switchable VSC stability control system, which can be adjusted through three driving modes, and a torque-sensing limited slip differential. Seven airbags are provided, including a driver’s knee airbag. The six-speed automatic transmission available for GT86’s includes paddle shifts to give the driver the option of making manual gear changes.